There are many different ways to join a new length of yarn to the one that is already being used. 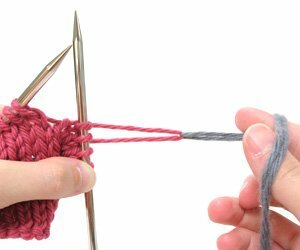 Like most knitting techniques, the method you choose depends on your personal preference and the specific project situation. Experiment with each and pick what works best for you! This is perhaps the trickiest 2-color join to maneuver, but it works out the nicest in the end. Practice it a few times and you should be well on your way. If you knit in the English style, anchor the old yarn with your left hand. 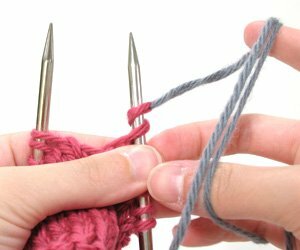 If you knit in the Continental style, anchor the old yarn with your right hand. Photographs show the English method. 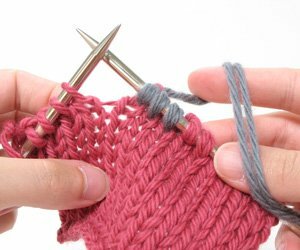 Stop knitting a few stitches before the place where you want to change yarn color. Loop the new yarn around the old yarn. Double the tails back and hold the new yarn tail with it’s working yarn in your right hand. Anchor the old yarn tail around the fingers of your left hand. Adjust the tension on the old yarn so that you have enough to complete the last stitches before the color change. 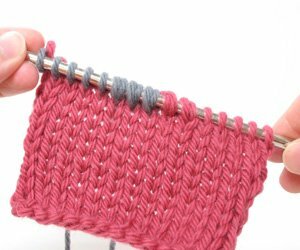 In the example, enough yarn is left to knit three more stitches in the old color (pink) before switching to the new color (gray). You can estimate how much you need by wrapping the yarn around the needle. One wrap is approximate to one stitch. Begin working the stitches. Keep the old yarn held in place until you have worked the stitches leading up to the new color. Work three stitches in the new color and then drop the yarn tail. 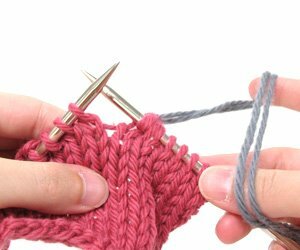 Continue knitting with the working yarn only. 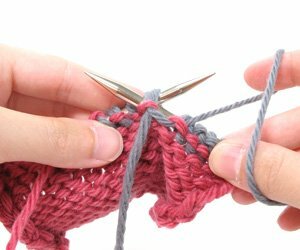 When working the next row or round, remember to work the stitches with 2 strands of yarn together as one stitch. Several rows later, you can trim the yarn tails to about an inch long. If you are using slippery yarn, consider weaving them in a bit more for security. This entry was posted in Colorwork, Joining Yarn, View All by Knit Picks Tutorials. Bookmark the permalink.